This month's color combo was created by the very talented Andrea. It's definitely a fun mix of colors, so we'd love for you to join in on the fun and play along too! Just visit the DeNami blog for all of the details and to see more samples from the rest of the DT girls. Sorry to be so short! I'll catch you guys up soon with things that have been going on. As always, thanks SO much for visiting! Hope you all have an awesome day! Happy Wednesday Everyone.... Hope you are all having a great week so far. Today I am just sharing a card I made up for the newest Product Spotlight over on the DeNami Desing blog. 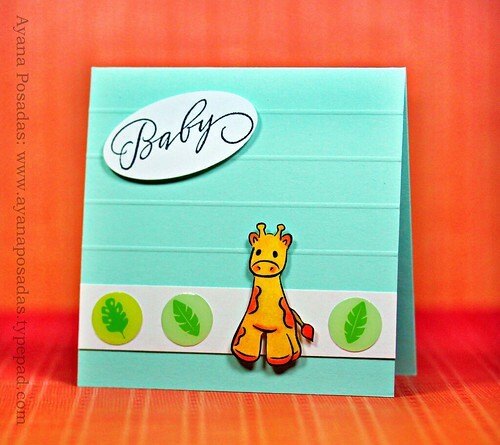 This month, we are showcasing this adorable little "Giraffe", from the most recent release. I sure hope you all will get a chance to stop by the DeNami blog today for some more fun inspiration from the rest of the design team girls, and also to get more info. on our cute featured image this month. Today is MY day to share some of my "Favorite Things" with you over on the DeNami Design blog! 1) Filigree Centerpiece- When I look at the Filigree Centerpiece image, I simply think: “pure elegance”. I just adore the classiness and stylish design of this image. One of my favorite things to do is to stamp it down multiple times in order to create an elegant background for a card. However, it can still be used as a main focal point too. It really is such a beautiful design! 2) Teddy Bear- I absolutely adore this little bear for one single reason---> CUTENESS!!! He just makes me smile! I think he’s just so perfect for any baby cards or new arrivals, showers, etc. I used the “Teddy Bear” image once on some baby party favors, and it was just the perfect touch! You can color him in or even just paper-piece him together. One of the great things about this particular Teddy Bear image is the fact that it can be used for both a boy and/or a girl. There are no limitations when it comes to this adorable bear! 3) Large Winter Tree- I never realized just how many things one could create with just a single bare tree image. Immediately after the first time that I inked up the Large Winter Tree stamp, I figured out just how versatile this tree really was. In the past, I have transformed this tree into a “Rhinestone Tree”, an “Apple Tree”, and even a “Button Tree”. One can even add leaves to the tree using one of the various styles of leaves that DeNami also carries in a few of their Petit Fours collection. Depending on what leaf is used will determine what “season” the tree is appropriate for. I always love a stamp that can be used in more than one way! This Large Winter Tree image is definitely one of those kinds of stamps! 4) Boutique Buttons- Hands down, in comparison to many of the other stamp companies, DeNami has one of the most amazing assortments of buttons. They are offered in so many fabulous colors! My two favorite assortments are “Bubblegum” and “Espresso”. I just love these boutique buttons and their variety in colors, shapes, textures, and sizes.